How Much Fiber Do We Really Need? Fiber has no calories, makes you fuller faster, and isn’t digested by your body. Adding more fiber to your diet has multiple health benefits, such as lowering your risk of diabetes and heart disease, preventing and relieving constipation, and most of all, aiding in weight loss [source: Mayo Clinic]. The way fiber works is simple. “As fiber winds its way through your digestive system, it grabs fats and carries them all the way through to the colon, where a fat-and-fiber package is bundled, water is extracted, and the bundle eliminated from the body,” explained Vegetarian Times. Found in rough bulks of fruits and vegetables, fiber has no calories, makes you fuller faster, and isn’t digested by your body. 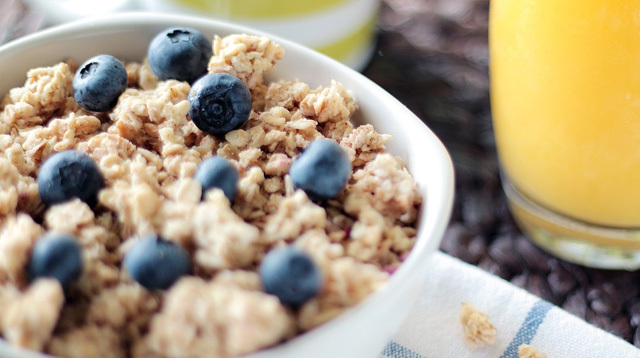 Just how much fiber do we need per day? Professional answers are varied. According to the Institute of Medicine, women need 25 grams of fiber per day and men need 38 grams, while the United States Department of Agriculture (USDA) recommends 14 grams of fiber for every 1,000 calories consumed. That means if you consume 2,000 calories a day, you need 28 grams of fiber. But just like the debate for the recommended daily caloric intake, fiber intake depends on your age, gender, height, weight, and physical activity. The University of Maryland’s Medical System created this online fiber calculator to help people get an estimate of their daily fiber needs. We tried the online calculator and entered the following details: 25 years old, 5'4" in height, female, small frame, and two hours of light exercise per day. The result: We need to take 1,244.6 calories and 20 grams of fiber per day. When reading labels of food items, it normally states the food’s total amount of dietary fiber per serving. In reality, there are actually two kinds of fiber—insoluble, also known as cellulose, which is found in the peels and husks of plant foods, and soluble, which is found in the fleshy interiors. Take an apple for example. The peel contains insoluble fiber, while the inside of the fruit contains soluble fiber. Insoluble fibers are found mainly in whole grains and peels of vegetables, while soluble fibers are found in the fleshy interiors of fruits and veggies. Most plant-based foods, such as oatmeal and beans, contain both soluble and insoluble fiber. To receive the best health benefits, Mayo Clinic suggests eating a wide variety of high-fiber foods. To help you CGs up your fiber intake, we found helpful online charts. Click here for a list of soluble fiber sources and here for insoluble fiber. According to Mayo Clinic, some people do need a fiber supplement if dietary changes aren’t sufficient or if they have certain medical conditions, such as constipation or diarrhea. Before taking any fiber supplements, it’s best to check with your doctor to know if the brand or type you are taking is safe, and how much to take.